Did you hear it on the news dear reader? They're saying this is Nor'easter. And its not even Halloween yet! And since this freakish weather has me down in the dumps (If you haven't been with us long, I hate snow. With a passion. It's only good on Christmas Eve. ), I've decided to bundle myself up in my favorite warm blanket, put on some hot coco and watch a little drama. And in a desperate attempt to find joy in this snow-trastrophy, I'm counting down my top 5 snow scenes in a costume drama. Despite the weather and foolishness going on outside, it is still Halloween season. And what better movie to mix both than Frankenstein? (It makes me start to think snow is appropriate on Halloween -- oh wait...) Frankenstein opens and closed with Victor Frankenstein scouring the North Pole for his creature. My fingers already feel numb just thinking about it. Have you seen this scene? Well, now you have(assuming you watched the youtube video above) and don't you feel much happier about snow fall? The movie may be pretty horrible, but Michael Fassbender tries valiantly to save it and turns in a pretty stellar kiss mid-movie. Admit is dear reader, if snow has to fall, it could at least look like the winter wonderland from Narnia while it does. And don't you wish you could go out in it with limited clothing on and a nice warm red scarf too? 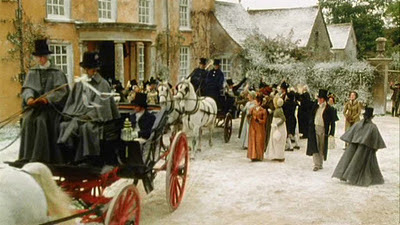 In many classic novels, marriages take place in the spring -- a complimentary allusion to renewal and fresh beginning, but in the 1995 version of Pride and Prejudice Darcy and Elizabeth get married with snow all around. (And I can get cheesy here too - the snow would represent the purity of their love and the honesty they will share.) Even though it looks freezing, everyone is so cheerful about Lizzy and Jane's marriages that they don't even feel the cold. I don't even have to type an explanation, do I?I hope I made your little snow day a little more cheery. I sure did mine!